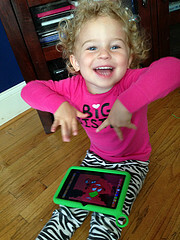 XO Tablet: What Do Toddlers Think? When I unboxed the XO Tablet, I wasn't sure how my two toddlers would react to the newest technology from One Laptop Per Child. They never did like the XO Laptop, nor the Nexus 7 for that matter. They were iPad addicted pretty much since birth. But then I bought them a new XO Tablet for $150. Wow! What a difference a touch screen makes, especially with a plethora (over 160!) educational software applications to choose from. The girls quickly found a color application and started taking turns coloring a toucan. While this video may seem pedestrian, it's actually amazing to see them get excited over a new technology and take turns using an application. With the iPads, there isn't much interaction they like to share - its mainly mind-sucking movies. So I was very happy to see how quickly the XO Tablet moved them from passive consumers to active producers. PS: Check out the unboxing and usage pictures here. We'll be posting thoughts and observations on the XO Tablet all week. Drop us a line if you'd like to write your own post on your thoughts about the XO Tablet - we always publish everyone's opinions. 1) How old are your kids? 2) Is there a list somewhere of what software is available for which intended age ranges? Aha, you do say that you have a two-year-old and a four-year-old. Now let me see if I can find a software list. My big Q: How do you think the reception will be for a 10 year old? I was going to ask some other questions - but browsing around I found my answers: microSD expandable storage, rear & front facing cameras (the tech specs are pretty thin @ Amazon). I think it would still rock for a 10 year old. There are advanced apps in biology and science that would be greet through middle school and it can switch into standard Android tablet mode with a swipe. Thanks! - I'm definitely clicking the 'buy' button. The bilingual approach is appealing to me as well, as it seems like a good way to help us (me) learn Spanish better/faster. Might this appeal to an 84-year-old non-techie grandmother who is in the early stages of dementia? We loaned her an iPad, which she seems to like for puzzles and photos, but she is hesitant to explore and easily gets lost from pressing in the wrong place. I think you could try to lock down the XO Tablet to only run a handful of aps - it comes with extensive parental controls. Also, some of the programs are very basic, so there is content as well.